At the Vermont Studio Center in Johnson, VT, in the Main Street lecture hall: poet Carol Frost, April 1; poet Alice Notley, April 19. www.vermontstudiocenter.org, 802-635-2727 (always confirm for VSC events on the day of ...). 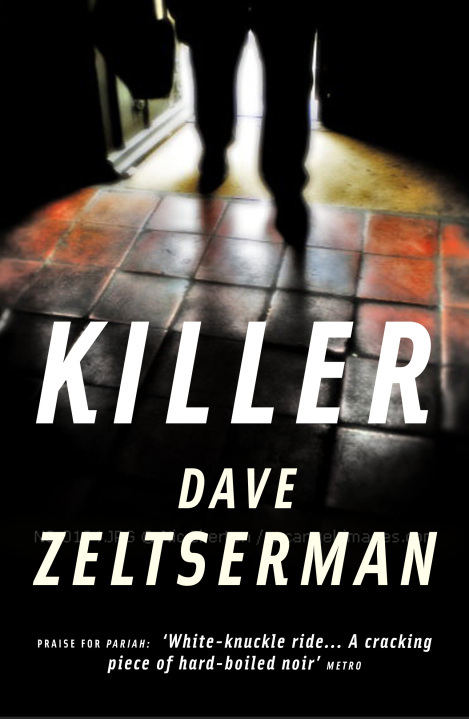 KILLER released in the United Kingdom in January, and it finally comes to the US on May 1; it's the third of Dave Zeltserman's much-praised sequence of crime fiction probing, "What happens after prison -- if the released prisoner has soaked up the psychopathic world of crime and murder?" 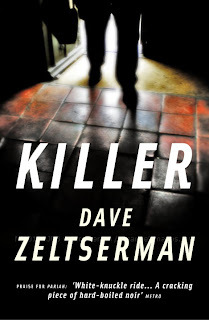 Zeltserman, a Boston Red Sox fan and Kung Fu expert, is one of today's most prolific voices in dark novels. Mere months after KILLER comes to US readers, it will be followed in mid August by THE CARETAKER OF LORNE FIELD, a truly creepy dance of "what if" and "here it comes." When he visits Kingdom Books in June, we'll get him talking about both of these, and about why and how he writes so much and so well. But for today, let's just look at KILLER. Like its pair of predecessors, SMALL CRIMES and PARIAH, the voice meeting you at the door is that of a prisoner shaped by a life of brutality and violence, in which the approval of crime bosses substitutes for that of a father. People in Zeltserman's cruel cities don't say "ouch!" when someone hits them -- they hit back, fast and hard. It's the code of life. For Leonard March, about to leave prison after 14 years, the only surprise is when people around him don't grasp that code. It made perfect sense to him, negotiating through his lawyer with the district attorney, to trade knowledge of the most vicious crime boss around Boston, Salvatore Lombard, in order to have a chance at getting out of jail alive. Forty-eight years old at sentencing, and not known to have organized crime ties, he was facing 30 years to life -- heck, at that point, 30 years is life, more or less. So bargaining down to 14 years at least gave him a chance, provided he could dodge Lombard's hired muscle inside the prison walls for all that time. And as KILLER opens, that's exactly what Leonard March has done. There's a humble janitorial job, an insect-infested basement room, and a pittance of settle-down money available to him. It's cold, it's nasty, and it's easy to feel sorry for this man, now 62, working a gritty night job and despised or feared by anyone who's seen news of his release. I needed to distract myself from the memories that were pushing through the silence, and I forced myself instead to think of my pop, to remember what he was like and how he would react if he were alive now to see me cleaning bathrooms. It had been a long time since I'd thought of him, but I knew he'd be happy to see me at a real job and I knew what he'd tell me: "Nothing wrong with an honest day's work, son." Flashbacks to 1968 and 1978 eventually reveal Leonard's family and upbringing, and the reasons he became a hired killer. He's caught now in threats of death from multiple directions: from Lombard's enraged forces, and from the families of the 28 men he'd killed -- mostly undiscovered by law enforcement until a rash promise of immunity to Leonard drew him into revealing his own past, along with that of the crime boss he ultimately betrayed. ... what a dream. If that's what they were like, I was grateful that was the first one I could remember in over fifty years. For a good ten minutes I sat silently before I trusted myself to move. Only after the pounding in my chest subsided did I pull myself off the bed and shuffle off to the bathroom to splash cold water over my face and dry the sweat off. I made sure not to catch a glimpse of myself in the mirror. I didn't want to risk seeing those same hollowed cheeks and dead sunken eyes that that man in my dream had. Brace for it: Behind this smoothly narrated page-turner, there are levels of pain and loss that wait, along with the hardened criminals around Leonard, for a chance to strike. It won't be pretty. But it sure will be a compelling read, if you're up to all the darkness. Maybe it would be a good idea to leave a couple of lights on tonight, and make extra sure the door is locked, and the windows, too. Someone like Leonard could be out there now. In fact, it's almost a dead certainty. Thursday, April 1, at 7:00 p.m. poets Lawrence Raab and Regie O'Hare Gibson read from their work in the first of two poetry events at CPS this April. Entry donation, $2-$5 sliding scale. Mocha Maya's Coffee House, 47 Bridge Street, Shelburne Falls, MA 01370, 413-625-6292. Wheelchair accessible. See www.collectedpoets.com for more information on all our poets reading in April. Lawrence Raab (right) was born in Pittsfield, Massachusetts. He received his BA from Middlebury College, and his MA from Syracuse University. He has received the Bess Hokin prize from Poetry magazine, a Junior Fellowship from the University of Michigan Society of Fellows, and grants from the National Endowment for the Arts, the Massachusetts Council on the Arts, and the Guggenheim Foundation. His collection of poems, What We Don’t Know About Each Other, won the National Poetry Series and was a Finalist for the 1993 National Book Award. Recent books include The Probable World, Visible Signs: New & Selected Poems, and his seventh collection, The History of Forgetting (2009), all published by Penguin. He teaches literature and writing at Williams College. Author, songwriter, educator and workshop facilitator Regie O’Hare Gibson (above left) has performed, taught, and lectured at universities, theaters, and various other venues in seven countries, most recently Monfalcone, Italy where he received the Absolute Poetry Award for performance and writing. Both he and his work appear in the New Line Cinema film “love jones,” a film based on events in his life. He is a recipient of a Provincetown FAWC Herbert Walker Scholarship and is an instructor at Grubstreet Inc. His work has appeared in a number of anthologies and journals including The Iowa Review, Poetry, and The Good Men Project: Stories from the Front lines of Modern Manhood, and others. He is a National Poetry Slam Individual Champion, has been featured on NPR, HBO’s Def Poetry Jam, and WGBH-2 Art Close-Up in which his performance was nominated for a Boston Emmy. His first collection of poems Storms Beneath the Skin received the Golden Pen Award and he received his MFA in poetry from New England College. 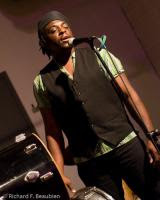 In 2007 he founded Neon JuJu: A literarymusic ensemble which combines spoken word and poetry with music and electronica. CPS also brings you a video archive that allows you to see footage from past readings: now on the site, readings by Galway Kinnell, Carey Salerno, Elizabeth Hughey, Lesle Lewis, and Nancy Pearson. Also, watch for information the second April CPR reading on April 15 with Adrian Blevins and James Haug. The Collected Poets Series highlights the work of established and emerging poets. Each event showcases the remarkable local poets of Western Massachusetts and the finest regional, national, and international talent. The series is usually held every first Thursday of the month. I know there are times my husband wishes I'd read in some other room -- but hey, we're partners in Kingdom Books, and I figure if a thriller is worth gasping over -- and then guffawing, and racing into the next scene, and marveling out loud how much fun it is -- well, Dave might as well know about it right away. But I suppose I should give a bit more detail, besides just saying that BULLETPROOF MASCARA drove me to e-mailing my best friends within a few minutes of finishing reading it, saying to each of them, "Grab a copy! Now!" Here's the premise: An international cosmetics company named Carrie Mae (say it out loud) is dedicated to the women it serves: "Our sales consultants provide needed income for their families and affordable, quality cosmetics for women everywhere." That's what the indomitable Mrs. Merrivel asserts as Nicole -- Nikki -- Lanier begins to question just what the deeper side of the corporation, the Carrie Mae Foundation, is up to. If she'd been a bit more introspective, she might have noticed that her own background in martial arts and multiple languages wasn't exactly the typical setup for handing out beauty samples. Carrie Mae's recruits have serious work to do, upholding the rights and safety of women around the globe. That's why Nikki is getting firearms training, as well as a set of highly improbable devices that can be hidden in lipstick tubes, powder compacts, and other feminine accoutrements. Her hair had been disoriented in the earlier tussle. Nikki watched as the ambassador's wife began to straighten it, patting it back into place with an unconscious and practiced hand. "Were you able to apprehend the assailant?" she asked with a polite smile, calm and order having apparently been restored. "No. Um, sorry," said Nikki, feeling deeply embarrassed. Somehow this was even worse than being failed by Mrs. Boyer. She'd never failed an assignment where the outcome actually mattered to someone. "We lost him behind an elephant." "Oh," Laura said, nodding, as if that explained everything. In fact, it's Laura, the ambassador's wife, who'll soon explain the facts of life in international crises: "I think diplomacy is more about finding the appropriate facts to justify something you've already done." Nikki needs that practical approach in order to complete the rescue she's attempting (with dangerous partner) in Thailand, as well as to manage her shoe situation -- and equally disturbingly, the possible CIA agent (male) dogging her footsteps. Trustworthy or not? More to the point, will he help her mission or get in her way? Crazy and funny as this adventurous thriller is, it's absolutely believable in quick bursts. And it's clearly the swift-tongued feminist rejoinder to John Burdett's Thailand crime fiction, as well as being a modern-day well-groomed James-Bond-in-earrings adventure. I'll be reading this again as soon as Dave recovers from all the laughing that I did the first time. Maybe I should take it out into the backyard and give him some peace. Then again -- the sooner he reads this one himself, the sooner he'll recognize that a "chick" fantasy of high-stakes espionage and wild times can be as gripping as the "guy" versions. Read it with plenty of cool beverages and snack food nearby, for a rollicking good spring/summer delight. National Poetry Month is April -- at least, as defined by libraries and many schools. And of course, April now holds the shiver of T. S. Eliot's words: "April is the cruelest month, breeding lilacs out of the dead land." I enjoy the blossoming of poetry in this season, and I'll add some poetry reviews over the next few weeks, among the mysteries. 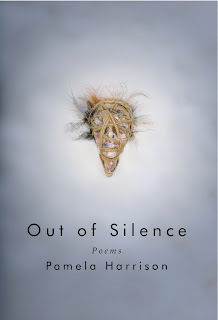 There are links between the genres, and Pamela Harrison illustrates this in her volume OUT OF SILENCE, which probes the mystery of her parents' dark love story. It could have been a dark thriller of sorts -- instead, as a volume of poems, it's an excavation, a baring of souls. freeing the pale moons risen there. Her head bent to the work like prayer. who lived in her deepest heart, sequestered. But soon Harrison lets go of this silken strand and allows her parents to stand without her, in their own youth -- falling in love in the post-Depression years when wealth and security were more than a dream; they were a necessary goal, an insistence beating in the blood. But there was darkness hidden in the romantic courtship and marriage, and it twisted the events that followed. Harrison writes in "Physician, Heal" of the pain her father endured from that precious wife's despairing actions: "Reckon the terrible, on-going, inescapable / shame of a doctor who could not heal / his marriage or his wife." Soon the small child that was Pamela Harrison begins to see darkness outlined and to realize that she "knows" about the despair and anger between her parents. Delicately, she paints the pain of knowing that her mother loves her brother best. She lays hints of the depression and mania that steal her mother's ability to parent. She smooths, irons, and hangs across the lines the fabric of secrets, the forced feeding, the illnesses and losses. Moving quietly among forms, Harrison probes the gap like a tongue drawn always to the missing tooth, the tender gum, the absence. I like especially a short, almost fragmentary poem called "What the Wind Is," and then the rustle of the poems that follow, always calling back and forth from past disaster to present grief: "Final Trial," "Fixity," "My Father's Well," "Climbing Sorrow." A pear's green peel exactly fits its own flesh. And we must fit our words to the world -- or we are mad. And when the collection concludes, we know something of the sorrow and loveliness of spring, and of this self-led exodus from darkness into blossoming. Harrison's book came out last summer and can be ordered directly from David Robert Books using this link. Some of the poems are also available in their entirety at the publisher site. I recommend OUT OF SILENCE as a salute to the new season. Novelist Walter Mosley -- better known to some as a crime novelist, but frankly enjoying crafting plays, teaming up for films, and insisting on his detective fiction being rich with contemporary questions like "post-race or meta-race world?" -- eased onto the stage at the Brattle Theater in Boston last night, in an hour-long exploration of his writing and his newest book, KNOWN TO EVIL (thanks to the Harvard Book Store for its sponsorship). He needs a new author photo; a hundred pounds slimmer than a year ago, energetic, and clearly jazzed as he read aloud the first couple of chapters, he charmed the crowd. In this second book featuring Leonid McGill (and he's writing the third), Mosley has moved away from his Easy Rawlins series. "The Easy Rawlins series is an homage to my father and my father's generation," Mosley explained. Now he wants to work with his own life and times: "These lives deserve discussion." He wondered aloud more than once about whether America has slipped past a racial society into something new, so new that we don't yet see and name it. Leonid McGill's Scandinavian wife is just the start of the complications ahead in KNOWN TO EVIL, and half of the trouble comes directly from his own family. "Easy Rawlins knows what's behind each door he opens," Mosley reflected; "for Leonid, every door he opens is different, behind every door there's a surprise. There's a world of all different possibilities. In many ways it's a much more complex world than that of Easy Rawlins." Mosley is doing a TV series based on the first Leonid McGill book, THE LONG FALL -- he's collaborating with Jonathan Demme for HBO. His first performed play seized good reviews this January and is slowly working its way to other locations. And he mentioned that he'd write even more books, if his publisher (Penguin) could keep up! He began writing at age 34, and now that he's about 58, he has some 30 books out there. If you've been a fan in the past, this new series is likely to seem just familiar enough to please you; if you're new to Mosley's books, though, I'd suggest jumping right in to KNOWN TO EVIL to sample what's on this author's mind, within the page-turning liveliness of a complex and insistent plot, and characters who question their lives, coming up with intriguing answers. 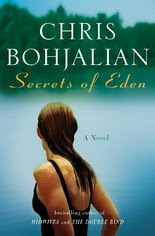 *SECRETS OF EDEN really began in 1997, in the midst of research for THE LAW OF SIMILARS, when a victim's rights advocate showed Bohjalian photos of the indents left by a woman's head colliding with sheetrock on a wall. See his web site for more details like this one! *It almost got lost entirely when Bohjalian's 2001 book tour stranded him in a hotel room in Denver for seven days, meticulously working on the book each day, but unable to face it (and the attached sense of claustrophobia) when he got back to Vermont. Kudos to this persistent writer for getting back, years later, to the sense that he needed to write a novel portraying the horrors of domestic violence. *Seven of the characters in THE DOUBLE BIND were named as a result of fundraising auctions for nonprofits; BEFORE YOU KNOW KINDNESS has three of these. *In SECRETS OF EDEN, Bohjalian felt that the angels component offered a good counterpoint to the icy and impersonal character of the book's first narrator (and soon lead suspect), the Rev. Stephen Drew. I'm not going to tell you about the "templates" he described, or his writing routine, or the way he uses two desks. Some things are best heard in person. So try really, really hard to get to a Bohjalian book event. Here's a link to his tour. Spring has arrived, ever so reluctantly, in the northern hills. We're glad that the parking area for Kingdom Books is snow free again! Green is creeping into the yard and buds fill the gardens. And we're already enjoying visits from book lovers. This past winter we drastically expanded our signed mysteries, which now make up half the shop -- and we have most of the latest titles, including Steig Larsson (alas, not signed, but we do have some British editions!). This year's visiting mystery authors will include David Carkeet (4/17), Howard Frank Mosher (5/15), Dave Zeltserman (6/19), and Eliot Pattison (August), and Erin Hart may be able to stop for a quick visit on her New England tour, too. March 26 (tomorrow!) at 3:30 pm at St Johnsbury Academy's Grace Stuart Orcutt Library, Kingdom Books co-hosts distinguished poet and novelist F. D. (Franklin) Reeve, with jazz musician Joe Deleault (session pianist with Jon Bon Jovi, Mighty Sam McClain, Cliften Chenier, Hilken Mancini, more). 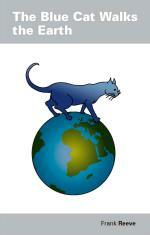 The two present "The Blue Cat Walks the Earth." The event is free and open to the public. 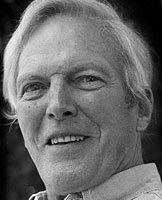 Afterward, we'll list some signed copies of Reeve's work -- you may already know him as the author of "Frost in Russia," since he was the translator assigned to travel with Robert Frost to meet Kruschev and Akhmatova. 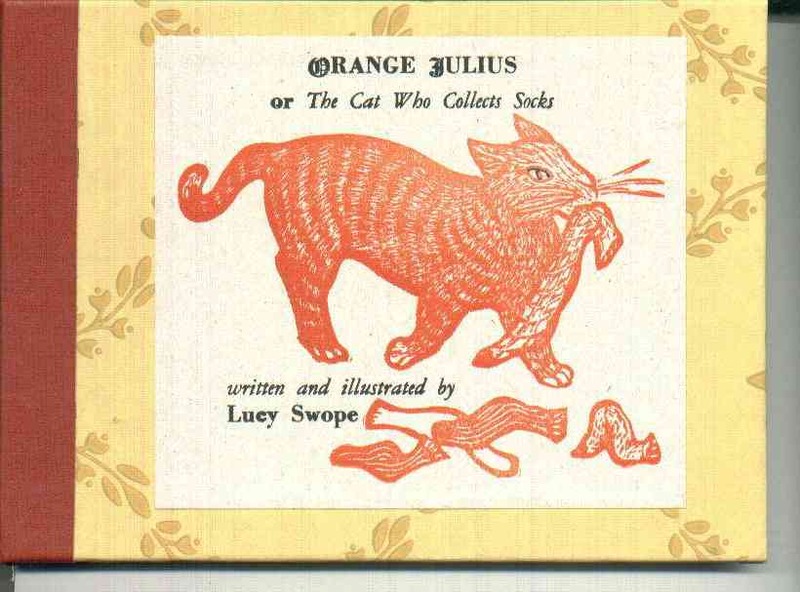 March 31: Few outside Vermont are familiar with the handmade, letter press and block print books that have been printed in such small editions (usually 100 or fewer) by Lucy Swope under the imprints of Elizabeth Farm Press and (more recently) Lucky Dog Press. Lucy is now in her 70s and still creating new books -- her most recent was The Mighty Zo Dog. 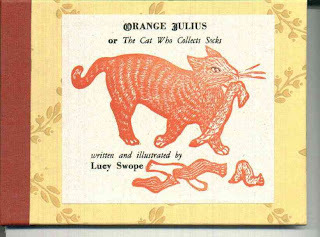 We're excited to announce that a Vermont legislative resolution honoring Lucy and her books will be read at the State House in Montpelier on Wednesday March 31, scheduled for 1 p.m. Lucy and her husband Stan Yarian (retired UVM prof) and their family will be on hand; so will Dave and I. If you can, please join us to celebrate this very special honor that comes so rarely to a loving creator of books. And if you can't be there in person, you may still want to contact Lucy to order some of her books -- we have a few also, but why not purchase a selection of them directly from the artist, especially at this festive time? You can reach Lucy at: Lucky Dog Press, 2798 Vt Route 113, West Fairlee VT 05083, 802-333-4642 (no e-mail). 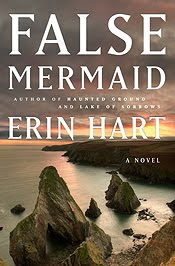 Erin Hart's third Nora Gavin mystery, FALSE MERMAID, sets a breathtaking pace of suspense and risk for the American pathologist, who has returned to her home state of Minnesota to probe the five-years-ago murder of her sister Tríona. Gavin's insistence on pursuing hints from the past positions her against her own parents, who resist the blame Nora has assigned to Tríona's husband Peter. It also makes her emotionally hazardous to her sister's daughter, Elizabeth, desperate to believe in the innocence of the only parent she has left. And, of course, every successful step she takes into the case pits Nora against the real killer or killers. Hart's two earlier Nora Gavin novels were set in Ireland, and she is herself an expert in Irish music and frequently visits Ireland. And there's no doubt that moving her series to Minnesota (her own home) takes some of the lush flavor out of this book. Although there are front materials that clearly tie the eventual plot to Irish mermaid myths and song, as well as to Irish terrain, it takes a long time for the action to return to the haunted landscape that Hart wove so beautifully into HAUNTED GROUND and LAKE OF SORROWS. Allowing visits to the Emerald Isle through the eyes of Nora's lover Cormac, left behind there, doesn't quite carry. Today was five years since Tríona had gone missing, nearly five years since her almost unrecognizable remains had turned up in an underground parking garage in the trunk of her own car. Nora knew she could not let herself be pulled into the downward spiral that seemed to draw her in whenever she thought of Tríona's murder. Nightmares and flashbacks were not a good sign. She reached into her pocket for the knot of green hazel Cormac McGuire had woven for her on their last evening together, at a place called Loughnabrone. Lake of Sorrows. A place where a number of people had died, where she had nearly lost her own life. She did not dwell on that thought. What she remembered most clearly from that awful day was the expression on Cormac's face when he saw her hands, her clothes covered in blood. And the relief that washed over his features when she said: Not mine. It's not my blood. But this time it may be. Peter Hallett, murderer or not, is a dangerous person to cross. And it turns out that sweet Tríona may have been dangerous, herself. "And what does all that mean?" "In psychological terms, you can see these stories being about women who desire autonomy and equality within marriage, or male fantasies about subjugating the power of the feminine. You can also see them as reflecting male anxiety about abandonment by females. Your choice." Poor Cormac! His anxiety isn't being helped by occasional glimpses of the danger that Nora is courting, a continent away -- and his own life isn't cooperating in his notion of flying to her side. But Nora isn't at risk of being consumed by Cormac, or subjugated by him. So as the dangers around her multiply, she at least has a safety route toward him, should she choose to take it. Not everything can go right in a situation this complex, and it's the powerless who get hurt. Don't count Nora among those who'll give up, though -- Hart demonstrates that a strong bent for scientific reason and an unreasoning but determined belief in finding the truth will work for Nora Gavin. At last, the rain has arrived -- short bursts of it this afternoon, but if we get some longer spells, it will wash the snowbanks down and get the soil thawing. I don't want the maple sugaring season to end too soon (it wraps up when the nights no longer go below freezing), but I'm ready for a change. She ran for the stairs. Sean didn't stop her, and despite her hike up and down Cameron Mountain, and the incident at Four Corners, she didn't break her stride on the two flights of stairs to her apartment. By the time she reached her apartment, all the hounds of hell might as well have been after her. Her heard was pounding and she was breathing hard, her heart racing, her stomach churning. Having Bowie there -- the open animosity between him and Sean -- must have prompted Sean to touch her that way. Talk to her that way. Look at her that way. But even if she solves the murder, what will Hannah do about this entanglement with a former smoke jumper from California -- who also grew up with her and knows her from way back? 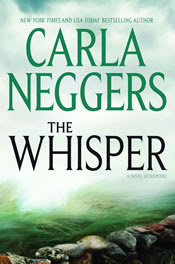 MIRA Books (Harlequin's mystery imprint) brought COLD RIVER out in paperback, but will release THE WHISPER, one of two 2010 novels for Neggers, in hardcover in July. This too is a sequel of sorts, to THE MIST, a 2009 hardcover (going into softcover this April) featuring Lizzie Rush as she impulsively interferes in FBI business. Set in Ireland, the book links back to Lizzie's Boston world -- and THE WHISPER carries these two allegiances and sources of adventure forward. Yes, I know it's a challenge to collect all the work by such an active author -- two books per year, twice in a row! (That's counting COLD DAWN as the second 2010 Neggers volume, due out late in the year.) But I've got to recommend it -- the twists of suspense by this Vermont author (whose locations of the heart also include Maine, Nashville, of course Ireland) are too good to miss. And because the books often chain into each other, the Carla Neggers web site provides a useful set of "reading order" lists for her four series. PS: Just to complicate life for the serious collector -- but as an added pleasure for devoted readers of this author's work -- ON FIRE, an earlier Neggers book (2003), was reissued by MIRA in February 2010. I've only picked up two hitchhikers that I didn't already know. One was wearing a tie and nice shoes, and turned out to be headed to the nearby Buddhist center. The other looked like some of the young men who had come home with my sons during high school: drooping skateboarder pants and an enormous skateboard clutched under one arm, other thumb extended, standing next to a local road and in need of a lift for a couple of miles. He reminded me also of the son of my old friend Sandy, a mom whose kids often wore such clothes, so I asked whether he knew her son -- and he said, "Yeah, and I guessed right away you probably knew his mom Sandy anyway." My hitchhiker explained, "You've got rocks on your car's dashboard. Sandy has pieces of wood on hers." Hey, the logic wasn't stellar, but the theory was sound: We live in circles, and sometimes they meet and cross as if they were ripples in a large and welcoming pond. Vermont poet Peggy Sapphire's circle includes conversations about Pete Seeger, whose music and freedom-fighting she admires and promotes. So when I opened her new collection, IN THE END A CIRCLE, I already had that memorable music in mind, as well as "Will the circle be unbroken by and by?" And that, as my father would say, goes to show that sometimes what you expect is actually what you find. In Sapphire's collection, there are poems of love and longing, poems that salute an earth-committed stewardship, poems that evoke the years of the Peace Movement (how could those have ended? ), and poems that pry deeply into Sapphire's life and soul -- and hence open windows into our own. And there are delicious turns of phrase that surprise and delight. "Steamy Sunday" brings back Aunt Ida as it opens with "She's dead now / but not from / too much chopped liver" and works its way through meals and savored aromas, until it suddenly announces: "and I knew / Aunt Ida had been loved / in a tropical way." And although the later poem "Subtraction" is not about the same relative, there's a sense of familiarity in it as an older woman, married to a man whose health is failing and whose grown children whisper about it being "past time," is knocked to the floor under the "dead weight" of her husband at last. the heart is not a bone. I like in particular the section called "Certain as Seasons," in which frost and the mourning dove -- "poor man's owl" -- become symbols of faith and faithfulness. Sapphire promises us a hereafter that may not be in a sky-blue heaven full of white puffy clouds, but rather is enduringly meaningful. And it is a rounded circle in which all promises are kept, with both honor and love. Meet Peggy Sapphire and hear her read from this collection on Wednesday April 13 at 7 p.m. in Montpelier at Bear Pond Books, where she will be joined by poets April Ossmann and Baron Wormser: www.bearpondbooks.com. Sure, crashing your car into the highway median in a wild swooping slide on the snowy road can be exhilarating when you're drunk. (Now, how would you know that??) And being tipsy enough to relax in the crash makes it less likely that you'll get seriously hurt. And that's the fun of it for Denny Braintree, despite the head wound he incurs at the opening of FROM AWAY. He's ready to welcome the eager crowds to his crash scene, and declares himself "bloody but unbowed." However, in every good moment, there's a spoilsport, isn't there? The trooper examined the license, his eyes going back and forth between the photo and Denny's face. Denny could have told him he was heavier now than when the photo was taken, but it was more interesting to let the trooper puzzle over it. Or maybe the trooper had looked at the birth date and wanted to tell Denny that he looked younger than forty-two. Anything was possible. Socially, the sky was the limit. The trooper handed the wallet back to Denny. "When you run off the road," he said, "it's not the road's fault." Oh, gosh. Unfortunately, if you live in Vermont, you've heard that one before. Either from your parents, your spouse, or, gulp, a trooper. But for Denny Braintree, a traveling journalist whose best moments are with model trains, it's all new. So is the confusion unfolding around him. It takes most of a day for him to realize what's going on: He's a dead ringer (oops!) for someone who used to live nearby, someone who was really really important in the social scene in and around Vermont's capital city/town, Montpelier. In fact, although he's probably lost his writing job, it appears he's gained someone's house, and even, er, girlfriend -- if that's what he wants. All things considered, it's hard to believe the man he's supposed to be could have wanted this particular woman in his life, though. David Carkeet has an acute eye for the embarrassments of life that come with body size and shape, accent, income or lack of it. His Vermont conversations ring surprisingly on target, for someone who -- like Denny -- hasn't always lived around here. And the rattlingly funny tale of murder, mayhem, and mistakes that he spins is a classic caper mystery, in the shoes of the great Donald Westlake. By the time Denny neared the police cars, the investigators were on their way into the woods -- all but one, who was lifting a black case out of the trunk. As he slammed the lid, he spotted Denny and waved. "I heard you were back, Homer," the man called out. "A sight for sore eyes." He was heading toward the woods but walking backwards, facing Denny. "I expect to see you out to your camp pretty soon." "In my mind, I'm already there," Denny said. The man laughed hard and long. Denny had no idea what his "camp" was. It seemed strange that he could get a laugh under these circumstances. Back home, his most carefully wrought jokes never produced laughter like that. The man suddenly turned somber. "Got to go. A grim scene up there, I expect." The "grim scene" includes another murder, and slowly it sinks in for Denny that maybe this Homer Dumpling had good reason to disappear. Or somebody disappeared him. Uh-oh. Brace for chuckles and guffaws, and a quick, tight plot. 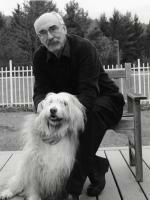 It's good to be able to welcome author David Carkeet to the list of Vermont writers. Even with all the crime up here. You can tell spring is almost here! All around us there are pans of maple sap being boiled to syrup, mud keeps deepening along the back roads, and ... the dates for "April Is Poetry Month" are appearing. Kingdom Books will co-host poet F. D. REEVE at the Grace Stuart Orcutt Library in St. Johnsbury, VT, on March 26 at 3:30 p.m. -- full details soon. I've got a dozen or more reviews to type this weekend, so brace for the flood. It's been a great week for reading, but not so good for sustained writing! 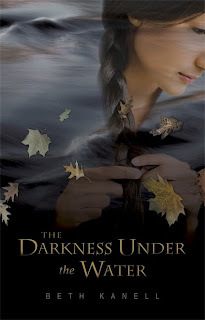 Meanwhile, I'm honestly thrilled that library media specialist Analine Johnson has published her video trailer for my own book, THE DARKNESS UNDER THE WATER (historical suspense, set in Vermont in 1930). The trailer is an amazing work of art, from a dedicated reader who knows how to convey emotion with power and beauty. Thank you so much, Analine. Our winter work here has included making sure a larger proportion of our mysteries are signed. Many are signed by the author on the title page, the classic way to add value and delight to a good first edition. We attend many author events, to meet the authors and ask them to add their John/Jayne Hancock to fine volumes. But what can be done about authors we don't get to see -- like Westerners who stay in Texas or along the West Coast, folks in the Deep South where we never manage to visit, and those hard-writing British, Irish, French, even Palestinian authors that we may never meet in person? 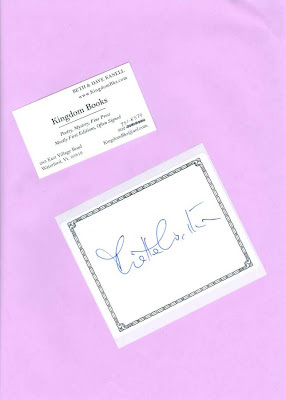 Dave's spent the winter getting in touch with many of them and asking them whether they are willing to sign bookplates that we send to them -- nice elegant ones, archivally stable, that we simply lay into the books (we don't do any "sticky stuff" here). People have been incredibly generous in saying yes. If you can't quite read the image below, it's the signature of phenomenal award-winning British author Minette Walters. Peter Lovesey, Matt Beynon Rees, Lee Child, Cara Black, Lawrence Block, and many others have also helped in this way. Others, like Joe Lansdale and Linda Barnes, recently signed books directly for us. More arrive daily, as the old expression goes. And join us, please, in appreciating this added level of connection between mystery/crime authors and their readers. Thank you to the authors and readers! Jodi Picoult's book tour for her 17th novel, HOUSE RULES, began this morning in her home town of Hanover, NH, where the serene luxury of the Hanover Inn was set abuzz by a capacity crowd of readers. There were only three men in the group of about 200, but that only reflects the way people attend events -- Picoult says half of the people who write to her about her books are men. And for HOUSE RULES, there are going to be a lot of eager book-consumers of both journals. Picoult gave a reading from the early scenes of the book, which follows teenage Jacob Hunt and his family. Jacob's Asperger's Syndrome -- the high-functioning form of autism spectrum disorder so often found associated with knowing incredible numbers of facts but having no clue about "reading" the people around you -- means that his fascination with crime scene analysis goes way over the top. When he tangles with a real-life crime scene, though, his unusual behaviors target him mistakenly as a possible criminal himself. "The reason I wrote it is because our legal system works really well if you go about it in a certain way -- but if you don't ..." Picoult gave suggestions for how police and juries could both misread the flat voice, lack of eye contact, and periodic overload outbursts of a teen with Asperger's Syndrome. Yet in her reading, her delight in Jacob as her "all-time favorite" narrator comes through clearly, as it also does on the printed page. Jacob's confusions, the stresses in his loving family, and the sparkling dialogue in this book keep it lively -- and the plot makes it a true page-turner in the best sense of suspense and caring about the outcome. Questions today for this popular author ranged all over the map, from how she came to write My Sister's Keeper (from a distraction during the research for her earlier book Second Glance) to the frustrations of how the film version of that book got changed by the director -- something that has been mercifully avoided with film versions of other Picoult novels on the Lifetime channel. But the most interesting segments had to do with HOUSE RULES and how Picoult did her research and chose her approach to the story. "The funny thing about writing Jacob's voice and learning about Asperger's is that I became convinced that everyone I know has Asperger's! [chuckle] Actually we all do, a little bit." Picoult spent a lot of time with boys who've been given the Asperger's diagnosis (they behave very differently from girls with the same syndrome), and sent a questionairre to about thirty-five teens with Asperger's, and their parents, in New England -- and got hundreds of pages back. "So really all of my research came from kids that have Asperger's and they are very aware that they have it." And the book title? "One of the things you learn about kids with autism and Asperger's is that rules and routines are paramount." Jacob's family has rules for him and for themselves, and that framework is critical in living as a family. Also a hot topic in any crowd already aware of autism spectrum disorder (ASD), now said to affect one child in every hundred in America, is the possible role of disease vaccinations in triggering the disorder in toddlers. 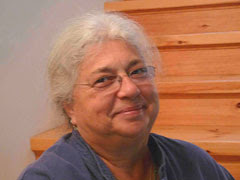 Picoult reviewed the latest research, including the controversies around how it was done in humans, as well as the less controversial work in primates. "I do not advocate not vaccinating your kids -- I vaccinated all of mine. I do advocate having a discussion with your physician. It's not one-size-fits-all," she urged, commenting that at least one vaccine manufacturer, Merck, has responded to concerns by taking apart the classic MMR (mumps, measles, rubella) vaccination into three units, so toddlers can get vaccines for just one disease at a time, instead of three. Picoult said children currently receive 35 vaccines against 15 diseases before entering kindergarten, a sharp rise compared to a generation ago. "I don't think vaccines cause autism. However, I think that's semantics." She noted that half of parents of children with ASD believe there's no link -- and the other half are sure there is, and have some evidence to back this up. 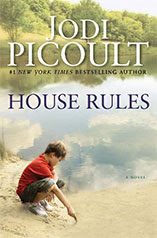 Picoult said readers will get a full dose of her opinions on the controversy as they read HOUSE RULES. Does she deliberately choose topics where she'll share information and education, along with her suspenseful plots and emotionally vibrant characters? She doesn't want to preach, and is meticulous about giving both sides of each controversy. But she added, "If my books leave the world a little closer and a little more tolerant, I will have died a very happy woman." The advent of the Espresso Book Machine has blurred the lines among self-publishing, print-on-demand, and small-run publishers. It's possible that some self-published work in this era of e-books will jump across those lines and leap into the tiers of top books; we're skeptical, but open to the possibility. And that means that we read a wide range of books, keeping an eye out for that mysterious stranger slipping into the mystery shelves. 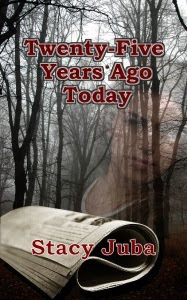 Stacy Juba's 2009 murder mystery, TWENTY-FIVE YEARS AGO TODAY, is available through a very small conventional publisher, Mainly Murder Press (www.MainlyMurderPress.com), which mostly prints on demand. It's based on the rapidly vanishing texture of the New England town newspaper and its quirky newsroom, where "girl reporters" start out writing the local news ... like, who came to visit at Mrs. Abernathy's last Thursday, and where the funeral will be held for Mr. Arthur Brown. Kris Langley is wading through this bottom-rung work for the local paper, grateful to have at least found a job that meshes with her insomniac/night owl habits, when she stumbles across a long unsolved murder. Her assignment, to locate items that the paper printed "25 Years Ago Today" to sprinkle among the pages, isn't supposed to be exciting. But when she decides to become an investigative reporter and tug on the loose ends, the benefits range way beyond having something interesting to write. Suspense, danger, and romance mingle in the pages. Juba is a former journalist who won awards in daily news, and her decision to write a mystery is well grounded in knowing how the newsroom pecking order works, as well as the tangles of small-town life that inevitably come back to haunt anyone bold enough to speak up about them. There's potential for reporter Kris Langley to develop a seasoned news nose, along with fresh independence of her own. For anyone building a collection of news-related mysteries, this will be a pleasant addition to the shelf. It also fits nicely into a New England collection, particularly Massachusetts. There's a fine tradition of borrowing characters from earlier work, often to tease and entertain. Jasper Fforde takes this to the n-th degree in his "Thursday Next" detective fiction, punning madly and playing wildly with the literary canon. Far more serious are the "continued" books in the name of earlier authors -- and somewhere in between are Laurie R. King's mysteries that entangle young Mary Russell with an aging Sherlock Holmes. In very different ways, I've enjoyed both Fforde and King. In this month's "Killer Books" reviews on the website of the Independent Mystery Booksellers Association there's mention of a new "Jane Austen" take-off: JANE BITES BACK by Michael Thomas Ford. Picture Miss Austen in modern days, living as a vampire ... OK, I know that sounds nuts, but it's no more crazy than what Fforde does -- and the reviews have been so upbeat that I'm planning to snag a copy soon. And that reminded me of a gem that I picked up in Boston in December: MURDER ON THE CLIFFS by Joanna Challis. I had to bring it home because the author is Australian, and Dave and I are dedicated fans of the dark mysteries by Australian author Garry Disher, which feature a protagonist named Hal Challis. Does that make sense as a reason to buy a book? Well, I confess we're in a lengthy binge of reading Australian authors lately. And it turns out Joanna Challis has written a lively and delicious "historical" mystery that allows the young Daphne du Maurier to seize life in ways that will lead toward her literary career (think Rebecca). This is the first in a sleuth series, and promises well. Now I've broken the ice into the area of light and sometimes romantic mysteries that are going to stay firmly on my side of the room. And I've got a few more to add ... stay tuned.